Another playful and winning story by the author of Pete the Cat: I Love My White Shoes! Hazel Nut wants her family to sing and dance along with her, but they are just too busy! Who can she call? Why... her super-hip, disco-dancing Grandma Nut! 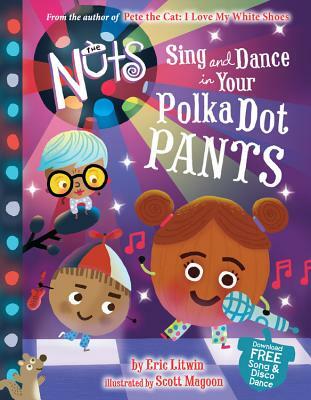 In the second book of the Nuts series, Eric Litwin's playful call-and-response rhymes and Scott Magoon's hilarious illustrations invite readers young and old to join in on the fun. Eric Litwin is the author of The Nuts: Bedtime at the Nut House and the first four beloved, bestselling Pete the Cat books. He is also a seasoned children's performer. "Children will ask for it again and again." "I could not believe how simple yet creative it was... Eric, inspired by folk songs, fun, and folksy folks, is a guitar-strumming, song-singing, banjo-picking, tale-telling, harmonica-blowing guy."